Wesley Warren, whose real-life struggle with a rare form of elephantiasis was captured as the star of TLC’s documentary series The Man With the 132-Pound Scrotum, has perished from a heart attack at 49. According to reports, the Las Vegas resident passed away on Friday at University Medical Center (UMC) after several weeks of hospitalization related to health issues other than his documented battle with the rare medical condition scrotal lymphedema, which brought Warren a measure of fame. Warren had been in the hospital for more than five weeks due to a series of infections related to his diabetes, and he had suffered two heart attacks while hospitalized. Warren gained some fame from his documentary series on the TLC network, The Man With the 132-Pound Scrotum, which detailed his efforts to receive treatment for a severe case of scrotal lymphedema, which is a form of elephantiasis that causes the scrotum to with watery fluid. His condition was very severe and extremely rare and it ultimately required surgery. Warren underwent a 13-hour surgery last year to remove the painful growth. He parlayed his peculiar medical condition into TV talk show guest appearances and stints on The Howard Stern Show and Comedy Central. Warren was an Orange, NJ. native and moved to Las Vegas with plans to work on the production crew of the movie Casino. When that plan fell through, he stayed in the area and started working for a company that found sites for ATMs. He had no immediate family in the area. 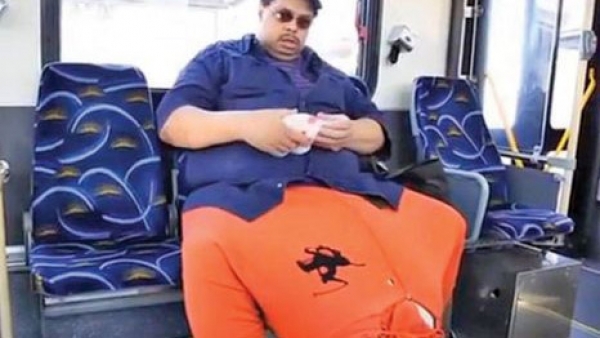 Wesley Warren, the star of TLC’s The Man With the 132-Pound Scrotum, who had battled a rare ailment only to perish from a heart attack at age 49, was 6-feet tall and weighed more than 500 pounds prior to his scrotum surgery. He was often outfitted in a hooded sweatshirt he would wear as makeshift pants to conceal and support his enlarged organ. Following the surgery, he posted photos and thank you messages on Facebook that showed Warren’s transition to a more normal life and he was very grateful for the support he received from the public. Even after his growth removal surgery, Warren continued to struggle with his weight and other health issues that were considered non-related to his scrotal lymphedema, such as diabetes, high blood pressure and asthma. His recent health issues are said to be unrelated to his previous condition. However, his growth was massive and created tremendous strain on his body for a long period of time. Doctors suspect that his scrotal lymphedema could have contributed to the other health issues he later developed, coupled with the long-term lack of mobility due to his condition. Medical experts have never determined what caused Warren’s scrotal lymphedema. Doctors have ruled out that a common cause of some enlargements, such as a hernia and fluid accumulation between the testicle and skin, could be responsible. Additionally, Warren had not traveled abroad to exotic areas where a mosquito-spread parasitic infection has been known to cause the condition. The star of TLC’s The Man With the 132-Pound Scrotum, Wesley Warren Jr., who battled a rare ailment, has perished from a heart attack. Due to his condition, Warren lived on disability and was unable to work. He hoped his rare condition could earn him money. Eventually, he signed a contract with a British company that filmed his struggles with his condition and his subsequent operation. He never disclosed how much money he made from the documentary and other TV guest spots, but ultimately, his condition did reap some rewards to compensate him for years of pain and suffering.